Here is post from a blog by Ken Myers that I came across and think it is worth sharing. It clearly describes key benefits of training from a parents perspective. In Aikido we would probably look at some of these in a different order. Let us know how you look at the benefits of Aikido for your kids! 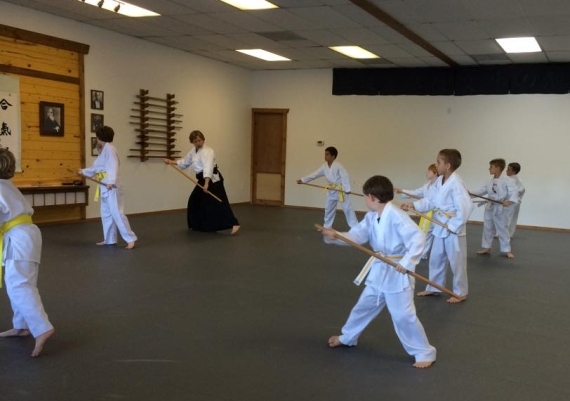 In a culture that seems to glorify violence in everything from music to video games and television shows, the idea of enrolling your child in martial arts training classes doesn’t always seem like a good one. While martial arts-centered action films seem to be filled to the brim with violent behavior and gory injuries, you may be surprised to learn that martial arts’ training is actually very beneficial to kids. Like so many other things that Hollywood doesn’t always get right, martial arts isn’t quite the brutal, vicious pastime that it seems. In fact, these are 10 of the reasons why you might want to consider Aikido training for your kids. Boosting Socialization Skills – Kids who don’t always thrive in highly social environments may find it easier to get to know people and make new friends when they’re in a room filled with peers who share a common interest. The kids on the playground may not always have much common ground, but enthusiasts of the martial arts are able to get to know one another through shared pursuits. Partner-driven forms like Aikido can also foster camaraderie, as they force kids to pair off and build their skills together. Encouraging Physical Activity – Limiting screen time is a great idea when it comes to getting kids off the couch and encouraging them to be more active, but it only goes so far. Enrolling an inactive child in such a physically demanding pastime not only discourages the sedentary lifestyle he’s used to, but also gives him an enjoyable activity that inspires him to keep moving. Learning to Set and Achieve Goals – Most forms of martial arts are based around an accomplishment system of colored belts that signify the wearer’s degree of skill. When your child strives toward each new belt, he’s learning valuable lessons about setting and reaching her goals. Increased Self-Esteem – Confidence comes with achievement, so your child’s self-esteem level will get a boost with every new move she masters and every belt she earns. Kids who struggle with a low sense of self-worth usually become more confident as time progresses while they’re enrolled in a martial arts class. Instilling a Sense of Respect – Learning any martial arts style will require your child to show her instructor unflinching respect. Today’s kid culture doesn’t always include respect for authority, adults or those in advanced positions. When she goes to her martial art class, though, your child will be learning lessons in respect along with new moves. Encouraging Non-Violent Conflict Resolution – Thinking that martial arts instruction promotes violent behavior is justified if your only experience with the activity comes from television or movies. In fact, many defensive styles, such as Aikido, teach kids peaceful, non-violent conflict resolution skills and emphasize the importance of avoiding a physical altercation. Improving Listening Skills – In order to master the skills he’s being taught and advance through the belt ranks, your child will have to exercise superior listening skills. Kids who aren’t always adept when it comes to paying attention to what they’re told can benefit from the verbal instruction and one-on-one work in the dojo. Developing Teamwork Skills – Whether learning a new technique or practicing safe fall from the the technique, there are few things that your child does in the Aikido classes that will be done on his own. Working together to learn new things and accomplish goals is an important life lesson for kids to learn, and instruction in Aikido can help your child learn that lesson.